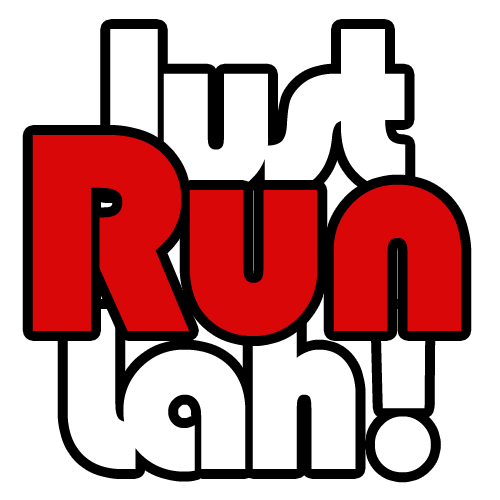 SSBR & AHM 2016 attracts 42,000 runners with an all-time high participation from family members | JustRunLah! SINGAPORE, 28 AUGUST 2016 [Press Release] The Marina Bay was abuzz this morning as Singapore Armed Forces (SAF) national servicemen and their families came together to keep fit and bond at the 24th edition of the SAFRA Singapore Bay Run & Army Half Marathon (SSBR & AHM). Themed ‘Together We Run’, the event was graced by Dr Ng Eng Hen, Minister for Defence and Chairman of SAFRA Board of Governors. 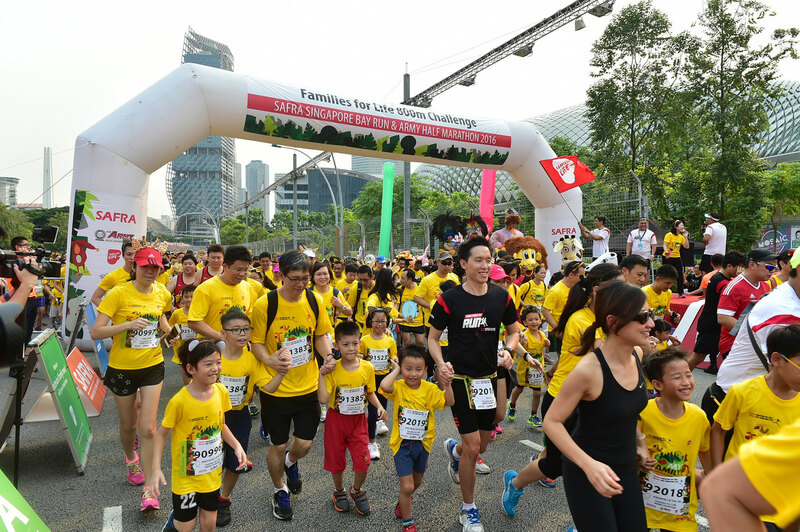 Jointly organised by SAFRA and the Army, the event attracted a strong turnout of over 42,000 participants and a record number of SAF national servicemen’s family members. About 7,000 family members participated this year, marking a significant 51 percent increase from 2014, with the largest surges in the SAFRA 5km Fun Run and SAFRA 10km Race. Several new initiatives were introduced by organisers this year to thrill the participants and enhance the running and bonding experience. Illuminated performances were featured among other street-side festivities, bringing exhilarating lights and sounds to the running route as Army Half Marathon participants pounded the road before the break of dawn. 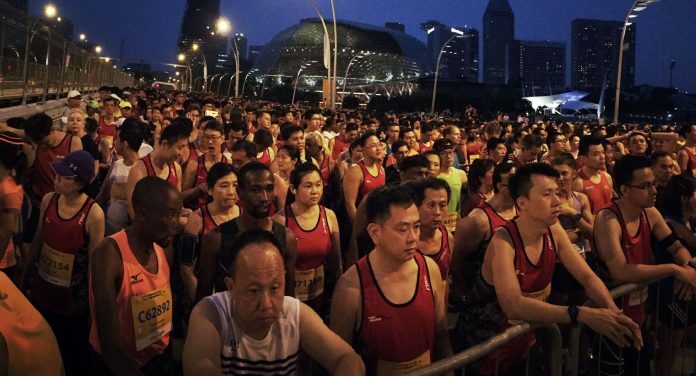 Half marathoners also got closer to the iconic Singapore Sports Hub this year with enhancements introduced to the running route to include the Stadium Park Connector. The SAFRA 5km Fun Run, which was flagged off by Mr Ong Ye Kung, Senior Minister of State for Defence and President of SAFRA, featured two giant inflatables, namely the Apex Ladder and the Rubble for participants to try out at the Promontory @ Marina Bay for the very first time and provided families with many fun bonding opportunities. Participation in the category also rose by 11 percent to over 6,200 runners this year. It was also a heart-warming family affair at the Families for Life 800m Challenge as over 370 mothers joined their spouses and children for the first time. This category, which was previously limited to father-and-child teams, was opened to both parents this year to enable more family members to participate together with the aim of strengthening the family bond. A series of animal mascots also brought much fun and laughter to the children before the run. Dr Mohamad Maliki bin Osman, Senior Minister of State for Defence and Deputy President of SAFRA, flagged off and joined participants in the SAFRA 10km Race before flagging off the Families for Life 800m Challenge at the Esplanade Bridge.